Developed by M.C. Byles in the 1930s, this heirloom tomato remains very much in demand in the Mid-Atlantic states. Mr. Byles, affectionately known as “Radiator Charlie” earned his nickname from the radiator repair business he opened at the foot of a steep hill on which trucks would often overheat. 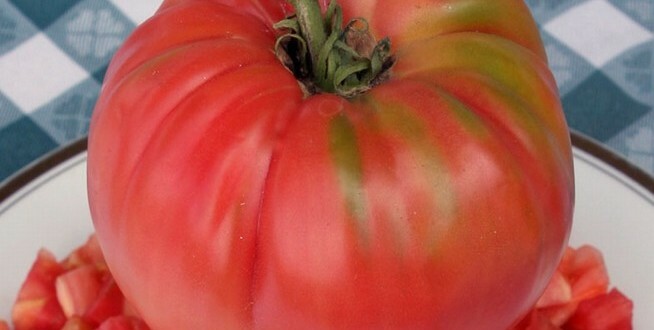 Radiator Charlie, who had no formal education or plant breeding experience, created this legendary tomato by cross-breeding four of the largest tomatoes he was able to find and developed a stable variety after six years of pollination and selection. He then sold his heirloom tomato plants for one dollar each (in the 1940â€™s) and paid off the six thousand dollar mortgage on his house in six years. It is said that each spring, gardeners drove as far as 200 miles to buy Charlieâ€™s seedling tomatoes. The large, slightly flattened, pink-red fruits that range from 1 pound to more than 3 pounds, are meaty, very flavorful and have few tomato seeds.